Well, this is a blog for a curated list of quotes on ‘Platforms’, the software type where one can exchange value. I shall also try to quote of the source (or where a quote was originally quoted!). Businesses want to move from a Pipe business model to a Platform Business model. The goal of the platform is to enable interactions between producers and consumers – repeatedly and efficiently. In recent years, more and more businesses are shifting from the pipeline structure to the platform structure. In this shift, the simple pipeline arrangement is transformed into a complex relationship in which producers, consumers, and the platform itself enter into a variable set of relationships. Yet all are operating businesses that share the fundamental platform DNA—they all exist to create matches and facilitate interactions among producers and consumers, whatever the goods being exchanged may be. The shift from protecting value inside the firm to creating value outside the firm means that the crucial factor is no longer ownership but opportunity, while the chief tool is no longer dictation but persuasion. Platform competition requires treating buyers and suppliers not as separate threats to be subjugated but as value-creating partners to be wooed, celebrated, and encouraged to play multiple roles. And while platform businesses themselves are often extraordinarily profitable, the chief locus of wealth creation is now outside rather than inside the organization. Thus, every platform business must be designed to facilitate the exchange of information. Yet, in most cases, platforms don’t create value units; instead, they are created by the producers who participate in the platform. Thus, platforms are “information factories” that have no control over inventory. Facebook’s news feed is a classic multiuser feedback loop. Status updates from producers are served to consumers, whose likes and comments serve as feedback to the producers. The constant flow of value units stimulates still more activity, making the platform increasingly valuable to all participants. Later still, LinkedIn created another interaction when it allowed thought leaders, and subsequently all users, to publish posts on LinkedIn for others to read, effectively turning the site into a publishing platform. A platform’s overarching purpose is to consummate matches among users and facilitate the exchange of goods, services, or social currency, thereby enabling value creation for all participants. As a result of the rise of the platform, almost all the traditional business management practices—including strategy, operations, marketing, production, research and development, and human resources—are in a state of upheaval. We are in a disequilibrium time that affects every company and individual business leader. The coming of the world of platforms is a major reason why. Our goal is not to build a platform; it is to be across all of them. You think #Product and say why? I think #Platform and say why not? Have you ever wondered where the centre of a city is? Where do those milestones you see on a highway which tend to (->) 0 actually reach 0? How does GPS measure distances? Well, I took it upon myself to find out! What other city than our Bangalore? namma Bengaluru? Brilliant, so she is at a Latitude of 12.9716 and a Longitude of 77.5946. I am using the map visualization package called ‘leaflet’ to plot. More details on this package at this link. Look at the location, are you surprised? Well, I was. I was expecting it to be at the junction of old city (Chickpet) or some place near City Market or Chamarajpet! If someone from the future were to communicate to you (from another dimension using say Gravity 🙂 Interstellar style) and ask you to be in the centre of Bangalore, now you know where to wait! You just need to know when! 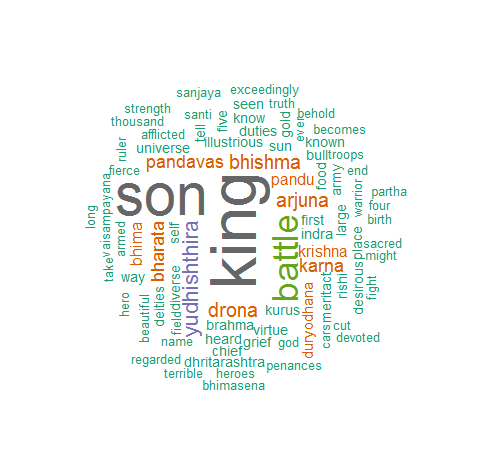 Following the wonderful feedback I got on my previous post (WordCloud in R – Mythological twist), I thought I could do a similar text analysis on the other great Indian Epic, the Mahabharata! This time it is bigger, a 5818 page, 14 MB pdf. The translation in question is the original translation from Kisari Mohan Ganguli which was done sometime between 1883 and 1896. The Mahabharata is an epic narrative of the Kurukshetra War and the fates of the Kaurava and the Pandava princes. The Mahabharata is the longest known epic poem and has been described as “the longest poem ever written”. Its longest version consists of over 100,000 shlokas or over 200,000 individual verse lines (each shloka is a couplet), and long prose passages. 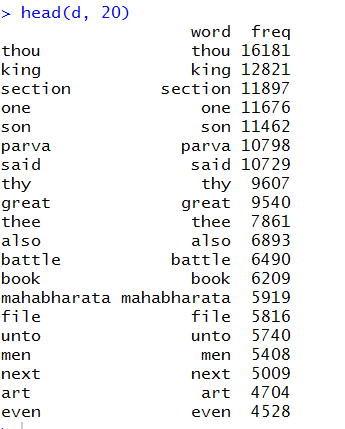 About 1.8 million words in total, the Mahabharata is roughly ten times the length of the Iliad and the Odyssey combined, or about four times the length of the Ramayana. The Epic is divided into a total of 18 Parvas or Books. Well, if Rama was at the centre of Ramayana, who was the equivalent in Mahabharata? Krishna? One of the Pandavas? One of the Kauravas? Dhritarashtra? Or one of the queens – Draupadi? Kunti? Gandhari? Since, this is a continuation to the first blog in this series, I would not take you through the intricacies of downloading and installing packages. Also, there is a Rpdf that needs to be installed, you could lookup on the instructions in this link. Download and copy the pdf onto a folder in the local file system. You may want to read the pdf in its entirety to a corpus. If I look at the environment variables, I can see the Corpus populated, which says it has 1 element and is of a 26.8 MB size. Now, we can begin processing this text, firstly create a content transformer to remove any take a value and replace it with white-space. 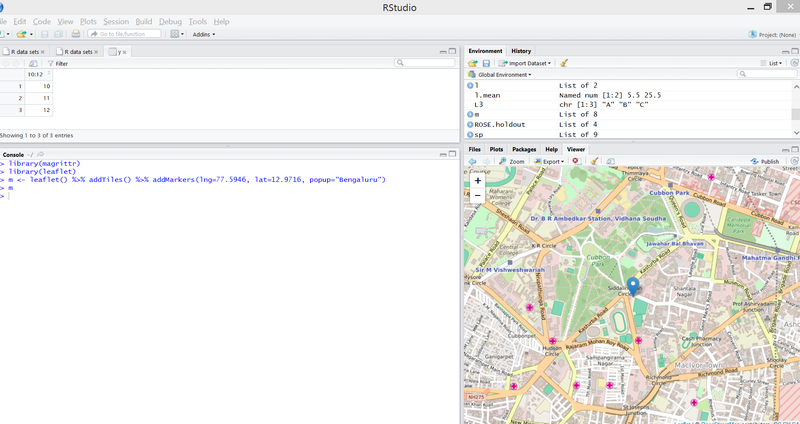 Next, we might need to apply some transformations on the text, to know the available transformations type getTransformations() in the R Console. 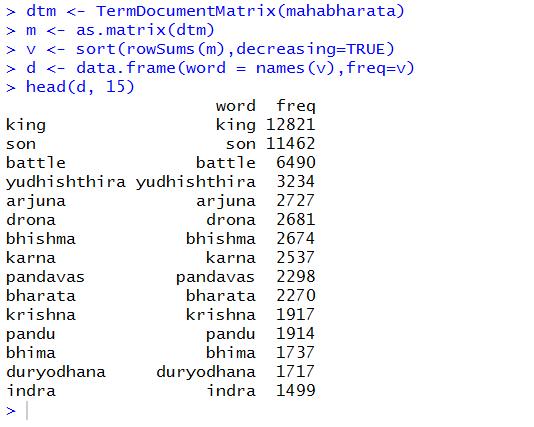 The next step would be to create a TermDocumentMatrix, a matrix that lists all the occurrences of words in the corpus. The DTM represents the documents as rows and the words as columns, if a word occurs in a particular document, the matrix entry corresponding to that row and column is 1 or it is a 0. Multiple occurrences are then added to the same count. Brilliant, Isn’t it after all about a great battle between sons to be a King?! The next occurrences throw up some interesting observations. and Krishna, who is considered central to the Epic is at 8th of most mentioned characters in Mahabharata. Have you ever wondered what it would be to do a textual analysis of some ancient texts? Would it not be nice to ‘mine’ insights into Valmiki’s Ramayana? Or Veda Vyasa’s Mahabharata? The Ramayana arguably happened about 9300 years ago. In the Thretha yuga. The wiki for Ramayana. 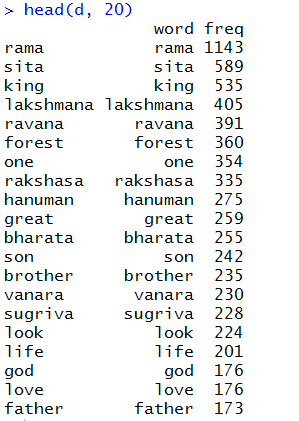 The original Ramayana consists of seven sections called kandas, these have varying numbers of chapters as follows: Bala-kanda—77 chapters, Ayodhya-kanda—119 chapters, Aranya-kanda—75 chapters, Kishkindha-kanda—67 chapters, Sundara-kanda—68 chapters, Yuddha-kanda—128 chapters, and Uttara-kanda—111 chapters. So, there are a total of 24,000 verses in total. 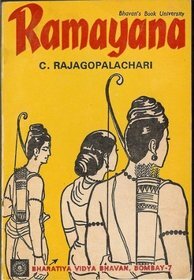 Well, I don’t really have the pdf of the ‘Original’ version, I thought I could use C. Rajagopalachari’s English retelling of the epic. This particular book is quiet popular and has sold over a million copies. It is a page-turner and has around 300 pages. How about analyzing the text in this book? That is exactly what I want to embark on this blog, text mining helps to derive valuable insights into the mind of the writer. It can also be leveraged to gain in-tangible insights like sentiment, relevance, mood, relations, emotion, summarization etc. The first part of this series would be to run a descriptive analysis on the text and generate a word cloud. Tag clouds or word clouds add simplicity and clarity, the most used words are displayed as weighted averages, the more the count of the word, bigger would be the size of the word. After all, isn’t it visually engaging than looking at a table? The ‘tm’ package just provides a readPDF function, but the pdf engine needs to be downloaded. Let us use a pdf engine called xpdf. The link for setting up the pdf engine (and updating the system path) is here. Great, now we can get rolling. Let us create a pdf reader called ‘Rpdf’ using the code below, this instructs the pdftotext.exe to maintain the original physical layout of the text. Now, we might need to convert the pdf to text and store it in a corpus. Basically we need to instruct the function on which resource we need to read. The second parameter is the reader that we created in the previous line. If I look at the summary of the variable, it will prompt me with the following details. The next step would be to do some transformation on the text, let us use the tm_map() function is to replace special characters from the text. We could use this to replace single quotes (‘), full stops (.) and replace them with spaces. Also, don’t you think we need to remove all the stop words? Words like ‘will’, ‘shall’, ‘the’, ‘we’ etc. do not make much sense in a word cloud. These are called stopwords, the tm_map provides for a function to do such an operation. Let us also remove white spaces and remove the punctuation. Any other pre-processing that you can think of? How about removing suffixes, removing tense in words? Is ‘kill’ different from ‘killed’? Do they not originate from the same stem ‘kill’? Or ‘big’, ‘bigger’, ‘biggest’? Can’t we just have ‘big’ with a weight of 3 instead of these three separate words? We use the stemDocument parameter for this. The next step would be to create a term-document matrix. It is a table containing the frequency of words. We use ‘termdocumentmatrix’ provided by the text mining package to do this. Now, let us look at a sample of the words and their frequency we got. We pick the first 20. Not surprising, is it? ‘Rama’ is indeed the centre of the story. Voila! 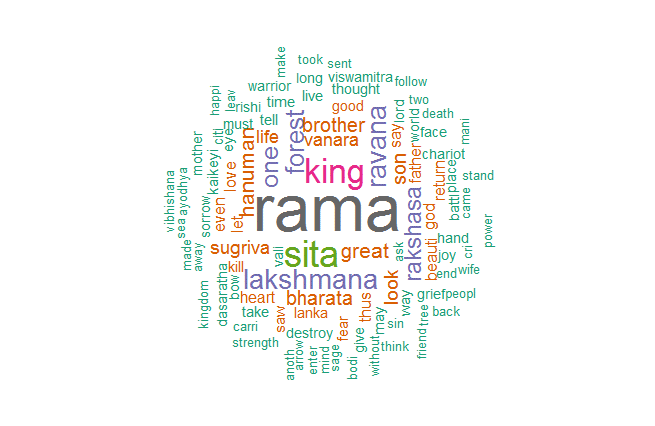 The word cloud of all the words of Ramayana. A view of plot downloaded from R.